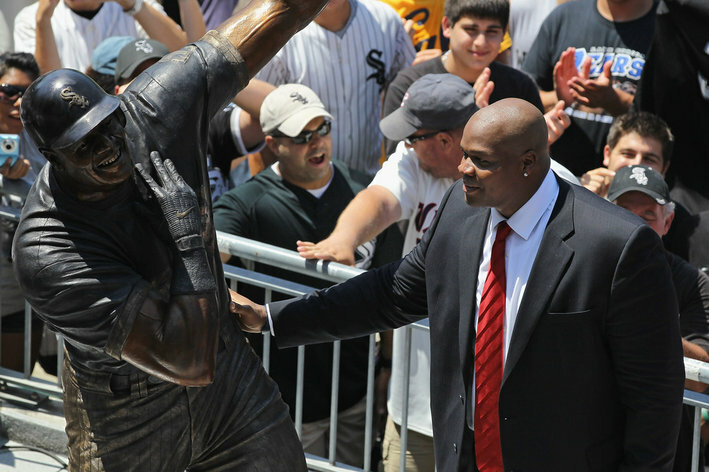 When discussing Frank Thomas’ career in the context of an era altered (or tainted) by the usage of performance-enhancing drugs, the result of drug tests are only a start. Any big slugger from the 1990s can be susceptible to those logical leaps, and there haven’t been many bigger sluggers — in appearance or performance — than the Big Hurt. Talking to former White Sox assistant general manager Dan Evans about Thomas earlier this month, Evans offered his own strong endorsement. So Thomas has character witnesses. Now all that’s left is the circumstantial evidence, and relative to his peers, he seems to meet the challenges as well as his size and talent would allow. 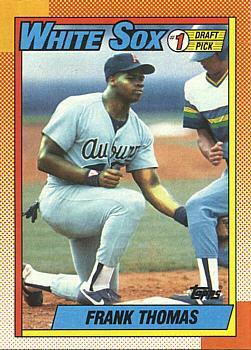 To the right is Frank Thomas’ rookie card, featuring the Big Hurt in his Auburn uniform. This card has always confused me, because it’s practically a screenshot from Super Nintento worstseller M.C. Escher Baseball. Which base of what side if he on? How did his glove end up behind the runner’s front leg? Is the runner safe or out? While there’s plenty of confusion over what exact baseball action he’s trying to do, there’s no mistaking his size. Even before he reached the majors, Thomas had the hardest-working pants in the game. His livery always looked two sizes too small, like somebody designed uniform decorum with the expressed intent of preventing him from dominating. Commissioner: We’ll let you play … but this is the biggest uniform we allow. Commissioner: They’re not clothes, it’s a uniform, and we have uniform rules. If you can’t wear it, you can’t play. Frank: I guess I have no choice. Commissioner: Dammit, you weren’t supposed to fit. Whatever he was doing, he was huge while doing it. And he was huge before that, because all the scouting reports emphasized it. Those players with verbal commitments to Auburn are: running back James Joseph (6-1, 190) of Phenix City, Ala.; quarterbacks Frank McIntosh (6-2, 175) of Camden, Ala., Dennis Wallace (6-3, 200) of Carrollton, Ga., and Reginald Slack (6-1, 185) of Milton, Fla.; offensive lineman Ross Fletcher (6-6, 280) of Atlanta’s Riverwood; defensive backs Dominko Anderson (6-2, 190) of Warner Robins, Ga., Eric Ramsey (6-1, 175) from Homewood, Ala., and Sean Smith (6-2, 194) from Opelika, Ala.; defensive ends Roy Hunter (6-1, 195) of Bessemer, Ala., and James Morrisette (6-0, 205) of Fairhope, Ala.; tight ends Frank Thomas (6-4, 245) of Columbus , Ga., and Lamar Rogers (6-5, 215) of Opp, Ala.; linemen John Hudson (6-3, 245) of Paris, Tenn., and Rob Selby (6-5, 230) of Birmingham; and placekicker Chris Dickerson (6-1, 165) of Birmingham. Thomas was bigger than two of three offensive linemen, and both defensive linemen. Now, that Thomas denied using and spoke out against it doesn’t necessarily mean he’s innocent, because, well, Rafael Palmeiro. But Thomas started talking about it years before Congress subpoenaed him — the first instance on record appears to be 1995 — and his words have never come back to bite him. In 2002, the conversation surrounding performance-enhancing drugs reached a new level when Jose Canseco threatened to write a tell-all book, and Ken Caminiti opened up toSports Illustrated. There’s a pretty fascinating story by Scot Gregor in the Daily Herald from May 30, 2002. The Caminiti story had just broken during a series between the White Sox and Yankees at Comiskey Park. That quote belongs to Jason Giambi, of all people. According to grand jury testimony in the BALCO case, Giambi admitted to performance-enhancing drug use from 2001 to 2003, so this statement is right in the middle of it. From that point on, Thomas didn’t waver in his support of stronger testing. He participated in the congressional hearings, although not particularly effectively, since he appeared via satellite and the feed had technical problems. The lawmakers pretty much ignored him. He was the only active player to participate in the Mitchell Report. He advocated against private fines for players who failed tests, wanting the names of users to be made public. The supremely skeptical could say there’s a chance Thomas merely lucked out, and that his indignation could’ve been revealed as a facade like Palmeiro’s with one poorly timed test. At this point, there’s probably not one feasible item of evidence that could qualify as substantial proof to said skeptic. However, having lived through the second half of Thomas’ career, he would have been better served if he had this ability to fake “appropriate responses” for all sorts of matters — contract issues, role disputes, injuries, etc. If he were able to carefully craft a Steroid Avenger persona with nothing behind it, one wonders why he wouldn’t have made his life easier by playing the media with other topics. The thirty-something Frank Thomas couldn’t hold a candle to the twenty-something Frank Thomas. There shouldn’t be any shame in that, since twenty-something Frank Thomas was one of the greatest hitters the game had ever seen. As Thomas got older, he had older-player problems. He lost mobility as he gained weight and battled nagging injuries, not necessarily in that order (foot and ankle problems made it hard to stay leaner). The loss of foot speed and bat speed forced Thomas to compromise his approach in his later years, sacrificing his batting average to keep the homers up, since he really couldn’t move on the basepaths. Fortunately for aesthetic purposes, Thomas retired before his lifetime batting average dropped below .300 (.301). Recency bias hurts many Hall of Fame candidates. Tim Raines and Alan Trammell had their best days early in their careers, but those who weren’t around in the mid-’80s are more familiar with them as role players. Thomas was more than a role player during his 30s — he hit .276/.389/.515 with 264 homers — but those rate stats wouldn’t look as remarkable when accounting for the partial seasons and DH penalty. If Thomas was that kind of hitter for his whole career, he’d probably struggle to find Hall of Fame support. But that’s the second half of his career, and the first just happened to be a stretch only Ted Williams can beat. In other words, it’s just a decline phase, and it seems like decline phases should be more forgivable in hindsight.